This week’s instalment of the #SBIDinspire series features the Rockwell Group, finalists from the Public Space category in the SBID Awards. SBID interviews the imaginative minds behind the projects to give an insight into their creative process and how they tackled some of the industry’s biggest and best projects. 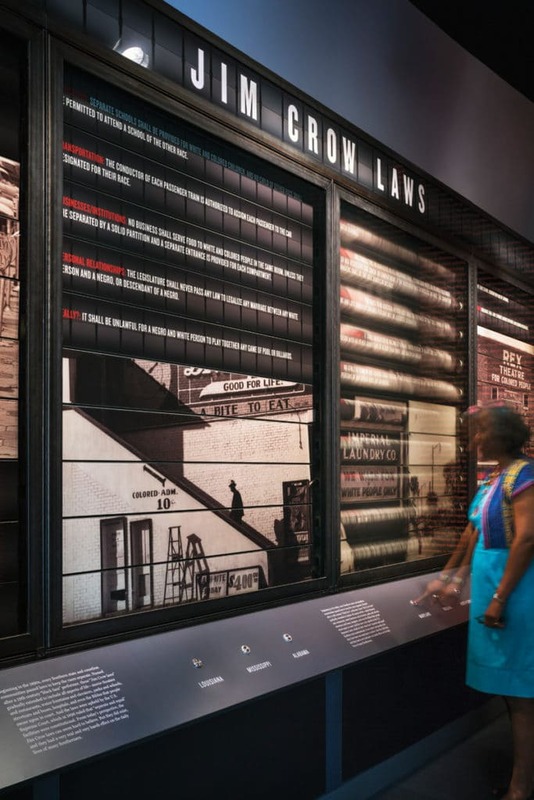 The Center for Civil and Human Rights tells the story and brings to life the American civil rights movement and introduces past and current human rights issues across the globe. 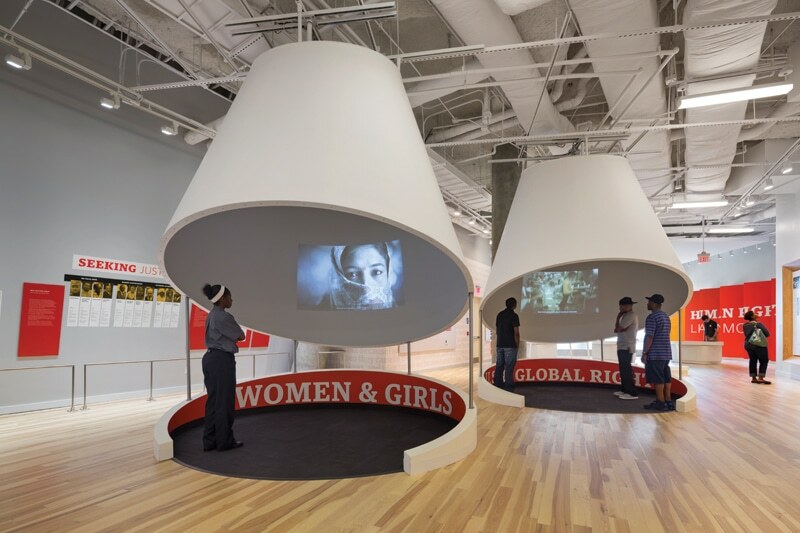 Rockwell Group designed the Center’s exhibition spaces in collaboration with director, writer and producer George C. Wolfe and human rights expert and activist Jill Savitt. 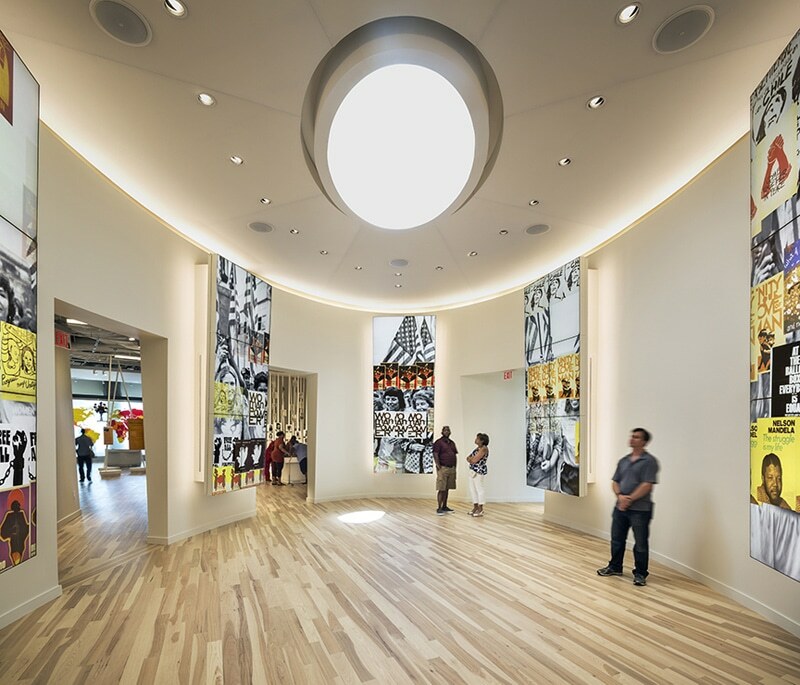 The Freelon Group (merged with Perkins+Will) and HOK are the architects for the project. 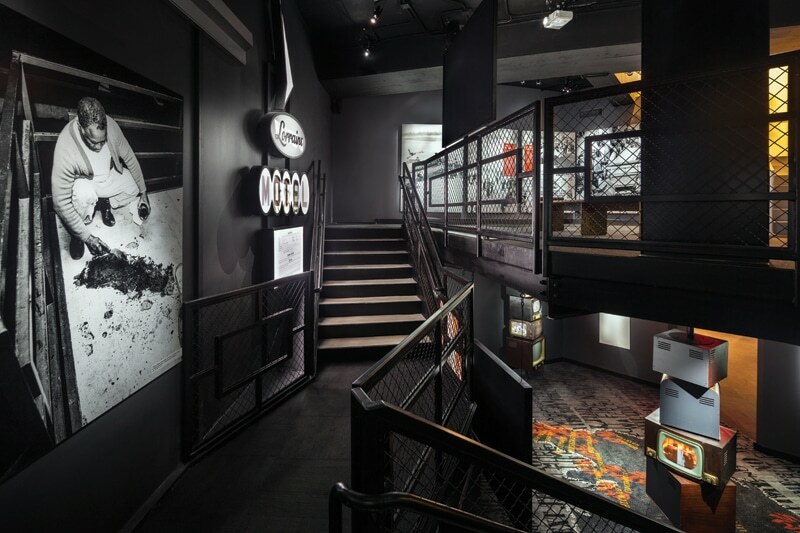 Rockwell Group’s design concept was influenced by theatrical devices and concepts, including framing, progression, scenography, thresholds, kinetics, and fragmentation, as well as contemporary art. 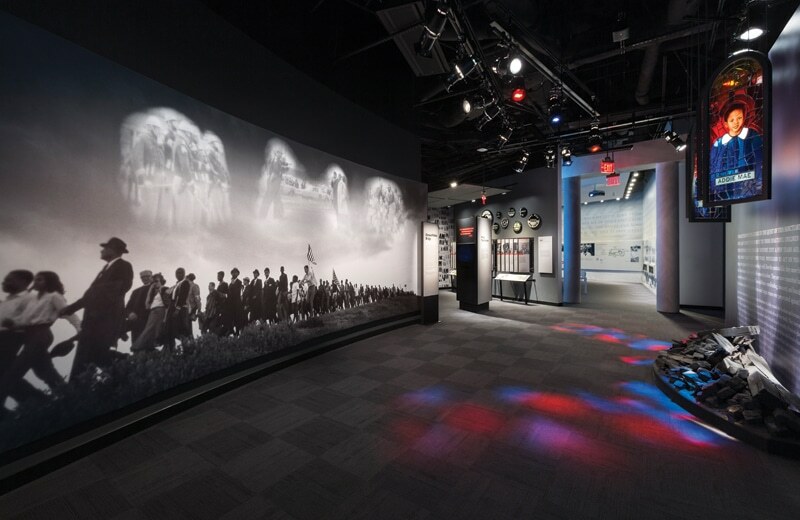 The exhibits incorporate a wide range of traditional and high-tech display techniques in order to create an experiential story at different levels, from individual to collective, local to global, and specific to general. 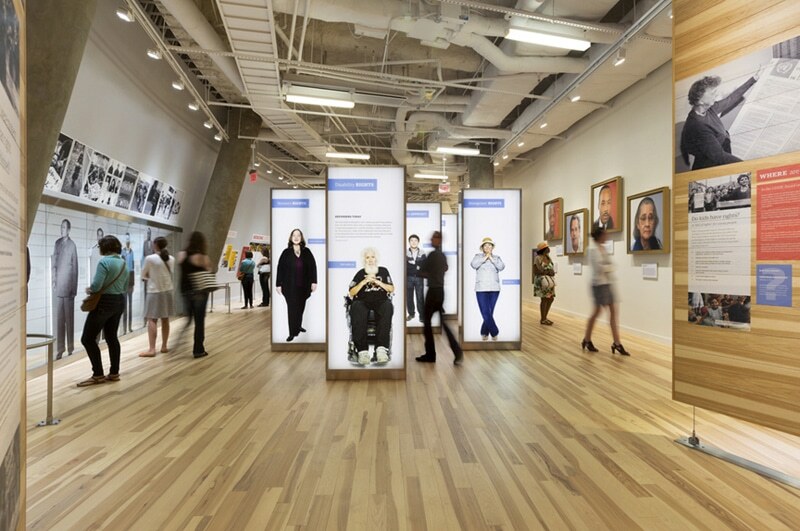 The distinct strategies served to address the varying needs of different types of visitors, as well as provide a wide range of experiences in order to engage visitors on different levels. 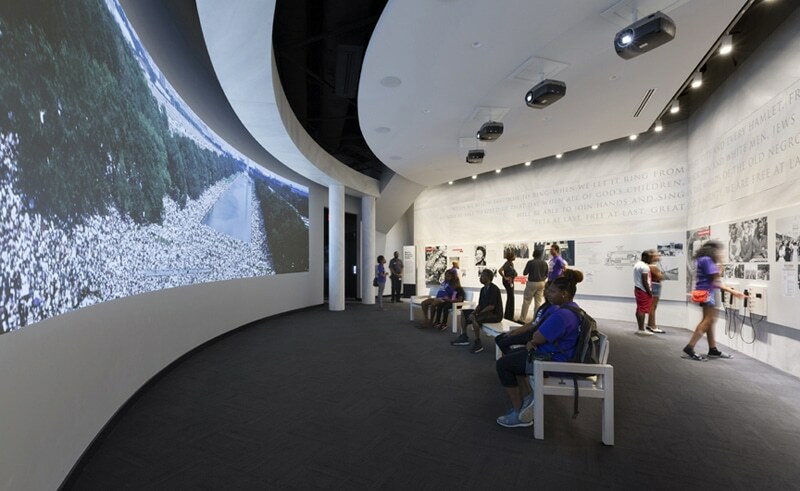 Immersive environments are a part of both the Civil Rights and Human Rights galleries. 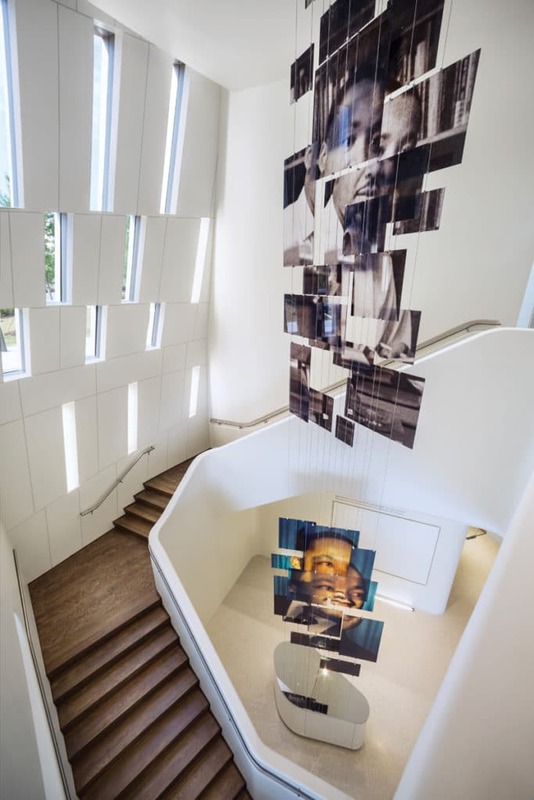 These were accomplished on the traditional end through large-scale super-graphics and ambient audio, and using more high-tech methods like large projections, immersive interactive structures, and sweeping panoramic videos. 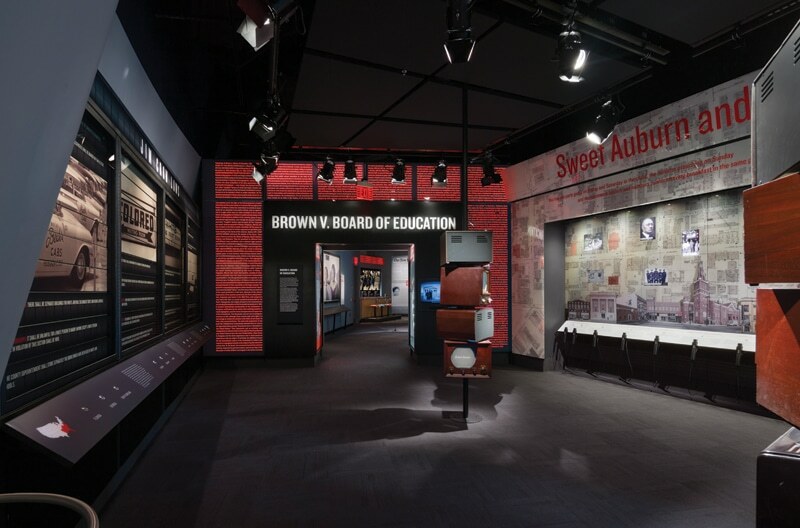 There was a substantial amount of information to work with for each exhibit. 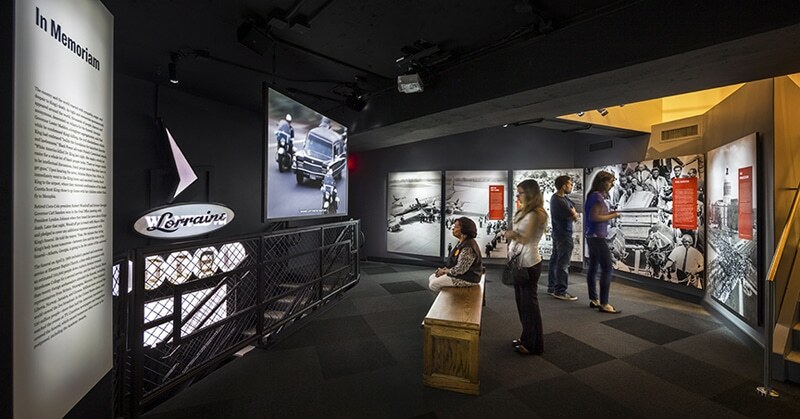 So the biggest challenge was deciding which key moments to highlight and deciding how to present the material in a way that would immerse and engage all visitors on a more individual level. 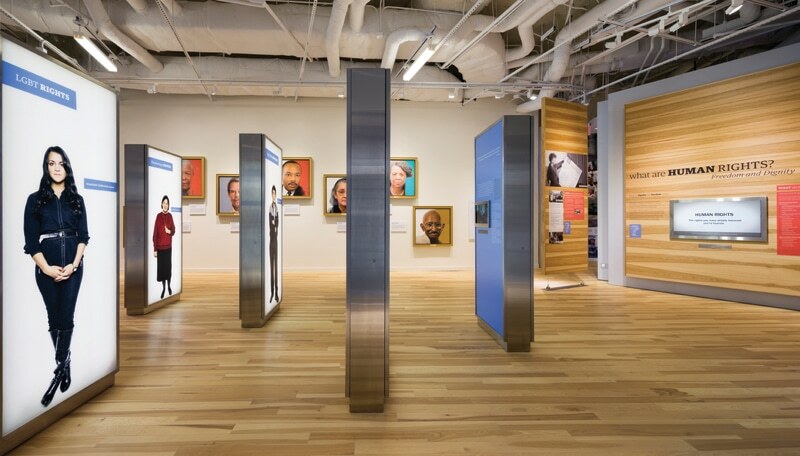 We utilized interpretive graphics, personal touch screens, and individual listening stations. 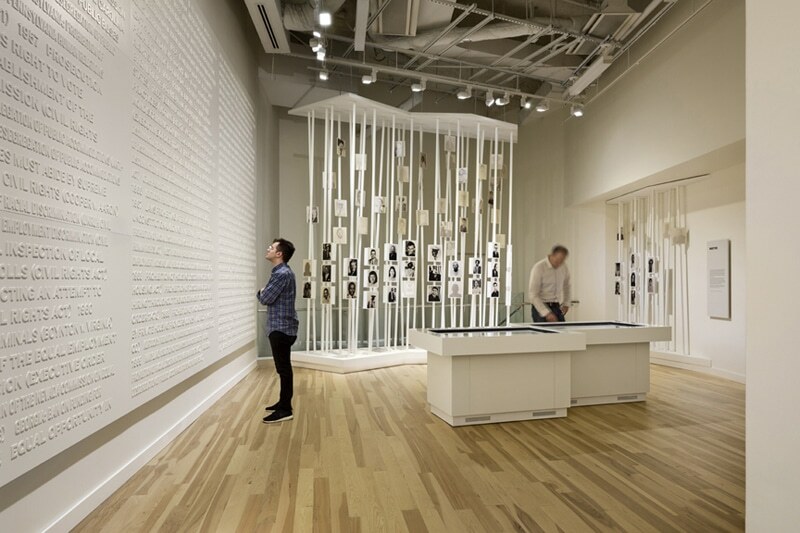 Visitors are also given the power to personalize their own experiences throughout the galleries through individual and group interactive kiosks, exhibits that are dependent upon the visitors’ traits or interests, and interactive tables activated by fiducial books. 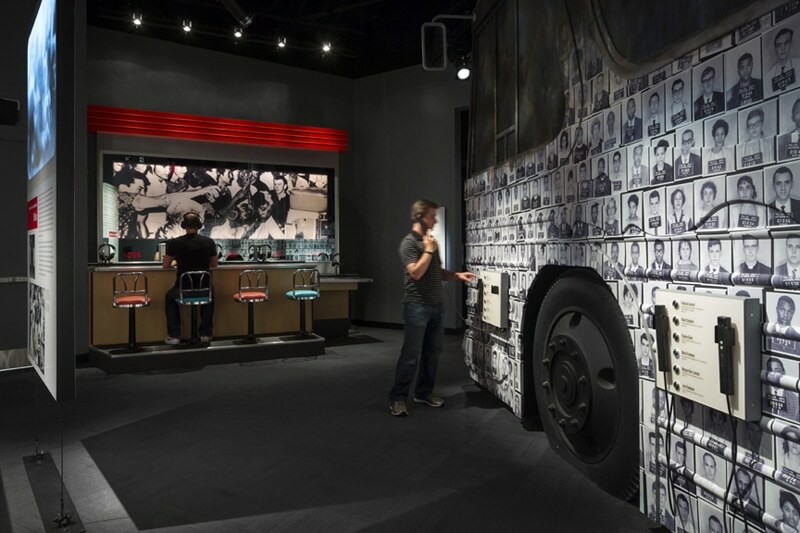 One of our favourite installations is the lunch counter sit-in reconstruction. 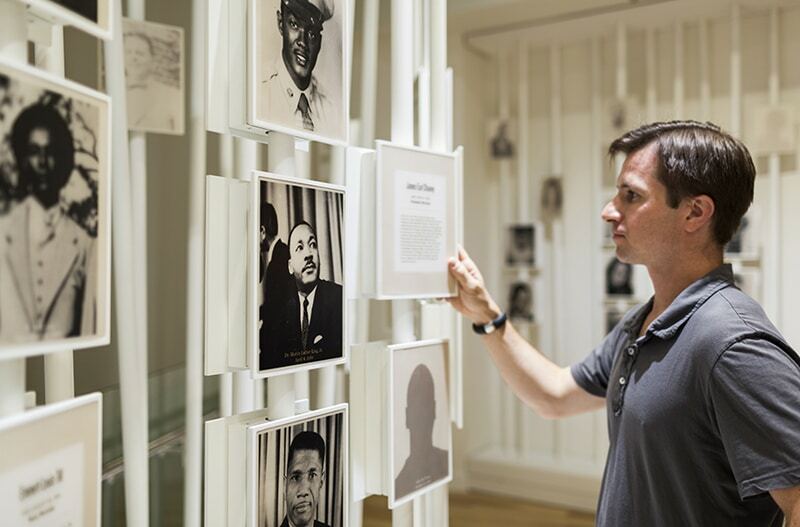 After visitors have seen some of the nonviolent protest methods that were employed by activists, they have the opportunity to image themselves as part of the civil rights movement. We created a reproduction of the famous 1960 protest at the Woolworth lunch counter in Greensboro, North Carolina. The counter has an interactive surface and headphones. 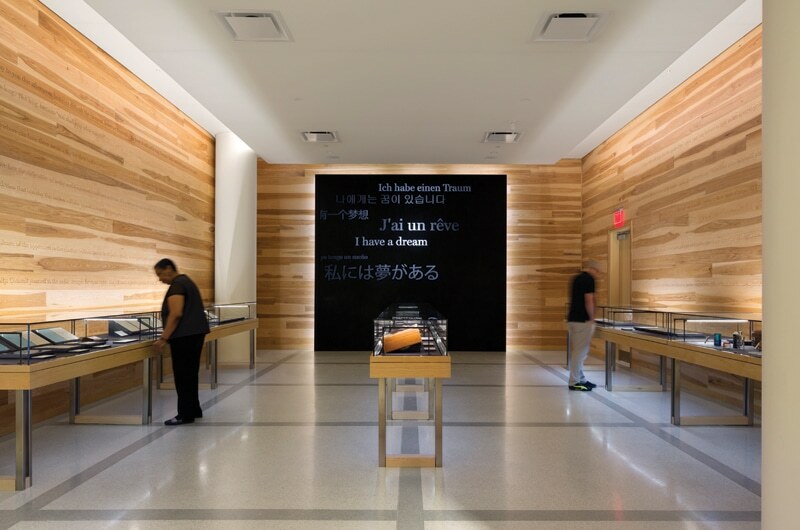 Visitors can take the place of a protestor in order to understand the discipline and focus that was necessary to maintain composure within a violent environment, mimicked by a binaural soundtrack that is activated by putting on a pair of headphones and placing their hands on the counter. The counter has sensors, so visitors will see how long they can keep their hands flat on the counter while listening to the binaural audio. We have been submitting projects to the SBID awards since 2013 over the years our projects have been honoured and appreciated by this great organization which values great design on every level.